"I love the way the light pours into the house", Jan says. "I'm very sensitive to dark and light and here there is always somewhere cool to sit or sunny to bask." "The angular roof line with its gallery windows captures views to the jacaranda tree's canopy, yet the lower sections of the walls block the views to the medium density development of single storey rooftops". "All parts of this house are being used." The brief for this suburban block was to design a sustainable home that would provide a wonderful place for the family to live while having minimal impact on the environment. The long site falls from back in the north-west to the street in the south-east, with a drop of several metres over the area where the house would be built. Coupled with closely located medium density neighbours, there was a need to cleverly design the external spaces so they and the house could access the sun and prevailing breezes, while maintaining their privacy. The resultant design celebrates these ideas and requirements, showing how they can be potent influences in design. This is shown by the lively and interesting form that steps down the site around specifically designed courtyards. The roofs over the living rooms have been designed to open up to the north, with appropriate solar protection offered to the carefully designed windows/doors. The roof over the children's bedrooms tilts in the other direction, offering a perfect platform for solar hot water heating and photo voltaics. The well insulated envelope and internal thermal mass greatly assist with the passive solar design. Materials were selected for their simplicity and natural beauty requiring little additional treatment, and low maintenance in the long term. The house is designed to step around a variety of courtyards, which provide private external living areas, beautiful views and/or cool air supply for the house. 18,000 litre water tanks, located under the house, supply water to the toilets, washing machine and landscaping. The garden has been designed with native plants, a "river bed" to accommodate the overflow for stormwater as well as for the provision of food for the family - chickens and a vegetable garden. Simple and intuitive methods for operating the house. Provision of home office facilities. Location of house near local facilities. Convenient location of storage space for recycling. Convenient storage for bicycles to encourage use. Good thermal performance of house. Good natural light and ventilation. Good views to the outside. Natural oils finish for timber floors throughout house. Wax polished concrete slab in rumpus room. Good thermal performance to result in minimal heating and cooling. Appropriate levels of insulation and thermal mass. Ability to zone areas of the house. Well designed natural ventilation throughout house. Good natural light throughout house. 1.5 kW photo voltaics for energy generation. Convenient, dedicated, sunny area for drying clothes. Efficient water saving fixtures and appliances. 18,000 litre water located under the house, connected to toilets, washing machine, pool and landscape. House and garden designed to reduce stormwater runoff and make a feature of overflow feature. Materials selected with thought given to reducing their impacts over their life. House designed to easily adapt to changing family lifestyles. Retention and extension of life for existing building and its materials. 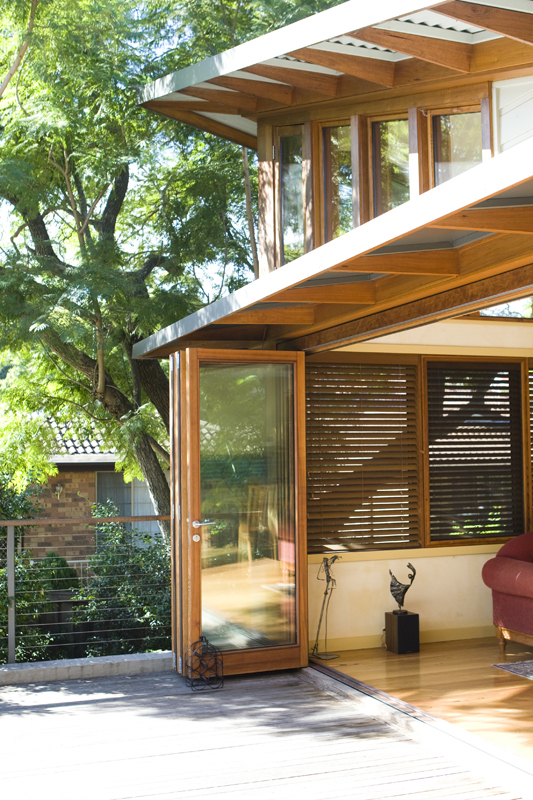 Timber from sustainably managed forests framed windows and doors. Recycled timber for new floor boards and decking. Sandstone and stones from original house reused in the garden. Size of project purposefully kept reasonable. Land used for building improved by project. Garden design to enhance local ecosystems and encourage local flora and fauna. Garden design inherent to house design. Inclusion of food plants and chickens to help provide for family. Connection of living areas to garden to assist in better care.